Great and smooth St. Lucian rum. A very pleasant sip. So, while I'm stuck in a train bound for Berlin (and the Berlin Rum Festival) for the next 6-7 hours, I might as well spend my time on something useful: Another review. I haven’t had the chance to visit many St. Lucian rums, so it seemed like a good idea to try another one. This is only the second one I have had so far and it comes from the same distillery as its predecessor - the St. Lucia Distillers 1931. 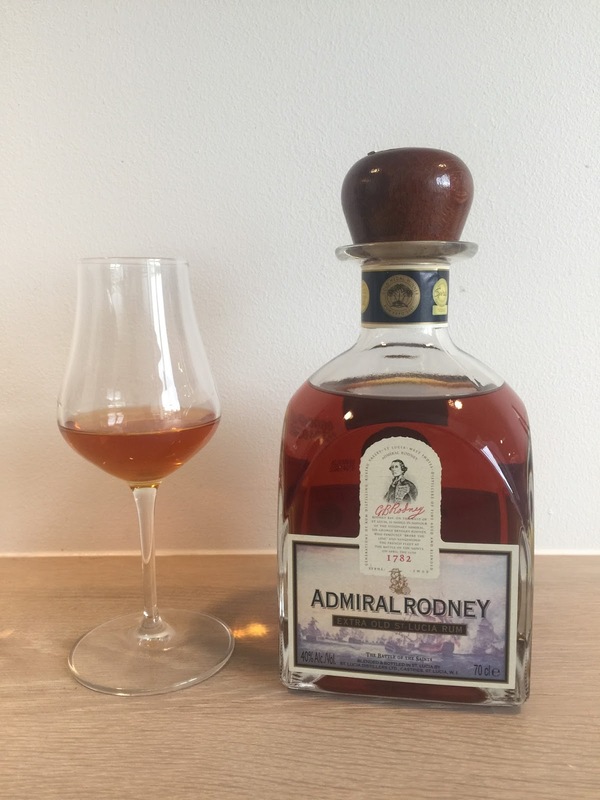 But this time I have my hands on its baby brother, the Admiral Rodney. The rum is named after the famous Sir George Brydges Rodney – or Admiral Rodney – who vanquished the French fleet at the Battle of the Saints on April 12th 1782. For info on this part, please consult your favourite history enthusiast. It has an average age of 12 years and is a 100% column still rum, blended from several individually aged batches. Ageing has been done in old Jim Beam, Jack Daniels and Buffalo Trace barrels. Apparently they are working their way towards making it a 15 year old by continuously adding older rums to the blend as the years pass. Huge respect for that. Bottled at ABV 40% it doesn’t stray from the beaten path of most rums. St. Lucia Distillers have a hugely informative website, and if you are interested in knowing more about the vision and passion behind the brand, I suggest you go pay them a visit. Furthermore St. Lucia Distillers are advocates of quality rum making and environmental responsibility. It might all be marketing drivel, but those exact kinds of drivel hits a soft spot with me. The Admiral Rodney carries the ACR marque. ACR is short for Authentic Caribbean Rum and is promoted by WIRSPA to identify rums which live up to certain standard of authenticity, provenance and quality. However, when browsing through the current line up of rums carrying the marque, I found the El Dorado 15, which have a massive amount of added sugar. So the ACR marque is not a sign that a rum is pure and unadulterated. A homemade hydrometertest on the other hand, shows no signs of any added sugar in the Admiral Rodney. Having read through the companys website and the info found there, this doesn’t actually come as a surprise, with their attention on quality and responsibility – and not so much focus on marketing. I have seen somewhere, that a box is usually supplied with this rum. Unfortunately it wasn’t a part of my purchase. Sadly. I do like good boxes. What I did get, was the squat bottle with its square base. At the end of the short neck, it has a very nice collar and a natural cork with a beautiful wooden stopper. The label depicts the historic Battle of the Saints, as well as a cartoonish picture of the famous Admiral Rodney. Around the neck it has a list of awards won at various competitions. On the back we find the ACR stamp, and a couple of taste notes. Nothing crazy. Immediately upon pouring it into the glass, you are treated with firm notes of vanilla, molasses and sweet oak. Very, very pleasant and soft on the nose from a great distance. Moving closer to the glass it gets a bit more pungent, with some notes of anise, orange peel and even an herbal, medicinal undertone. Nothing harsh or sharp, just a nice blend of clearly defined diversity with a lighter profile. On the very end of it, there is a slight tannic impression, but nothing like the heavy, winey Demerara rums. Very nice nose indeed. Light with clear scents, a nice balance and good diversity. So far it feels like a very solid product. Entering the mouth you are caressed by a velvety light and soft rum. The texture is a little buttery, which I usually don’t enjoy, but being less oily than e.g. the Cruzan SBE, there is no doubt that it is a quality in this particular rum. The soft vanilla/molasses/oak combination from the nose is the dominating part of the taste as well. It does display a lot more spice than the nose. Mainly cinnamon, orange zest and black pepper. On the more low key notes, I found milk chocolate and a touch of chamomile. The spices blend very nicely with the softer, sweeter side, and leaves you with a very balanced and complex impression. The finish is longer than I would have expected from a rum with such a light profile. As it disappears, it delivers more of the sweetness, the vanilla and the black pepper. But just as the fade starts to kick in, you are also introduced to a massive drying effect, which vacuums your entire mouth and leaves you only with a slight warmth in the very end. No leftovers of any kind. Just a clean mouth ready for the next sip – or the next rum. I can’t sufficiently describe how much this little piece of heaven surprised me. It is a very good rum. So good in fact, that I think it just became one of my favourite light rums. Such balance and complexity is not seen every day, and at the same time it is so casual, that I can’t find a reason why you shouldn’t be able to drink this an entire evening without being fed up with it. But those casual features are also what makes it a bit boring. It feels a bit too polished, a bit too casual and a bit too refined. Sure, you could have several glasses of this without being tired of it. But after just a few glasses you could easily forget what you were drinking. Remember a scene from Ocean's Eleven? Matt Damon is about to be sent into the casino to do his part of the job. He is instructed by Brat Pitt's character to: "Don't shift your weight, always look at your mark but don't stare, be specific but not memorable, be funny but don't make him laugh. He's got to like you and the forget you the moment you've left his side". This rum behaves in a much similar manor. The value for money is quite good at around the €55 mark. But truth be told you have a million other options in this price range. To name a diverse few, there is the Zacapa 23, Barbancourt 15, Velier Caroni 12 year old and Rum Nation Panama 18 - depending on your preferred style of rum. If you are into the lighter styled rums, you could choose the Havana Club Seleccion de Maestros at a few euros less, or the even cheaper Santiago de Cuba 12 años.